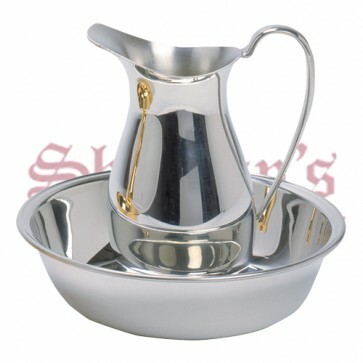 Polished pewter Ewer and Basin can be purchased as a set or individually. Ewer hold 20 oz. Basin diameter measures 8" Outside Diameter x 1 78" Height x 7 1/8" Inside Diameter. Also called a Lavabo Set. The set is used for the ceremonial washing of the hands and recitation from the Psalms by the celebrant before the Eucharist in the Roman Catholic and Anglican churches.